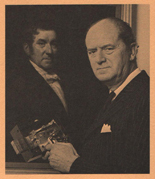 Lord Hayter holding a lock similar in design to lock number 452. A portrait of Charles Chubb hangs in the backgroung who seems to be looking on with pride. 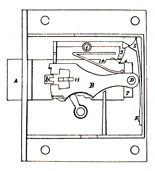 One of the arrangements of the Detector lock as it apeared in the Patent Drawing of 1818. Chubb's Detector Lock - The earlist designs with a rocker detector arm. 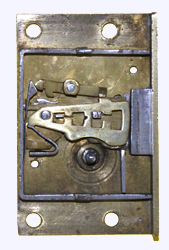 This, lock serial number 452, is the earliest known surviving example of a Chubb lock. It dates from December 1819 and features end-gating to reset the detector. This lock was found on a cast iron strongbox by Carron. The inset picture shows it with the boltwork still attached which is also marked Chubb on each of the bolt heads. Case Size: 155 x 106 x 40mm. 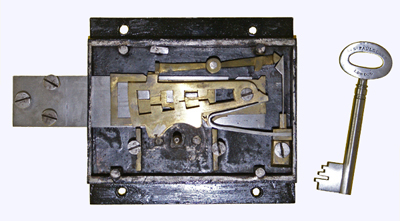 4 lever plus the detector plate. 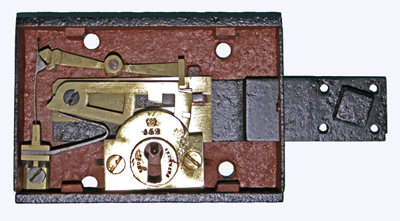 Despite its small size this lock features a fully functional detector to the 1824 patent where it can be reset with the normal operating key. Size: 45 x 70 mm. 3 levers plus the detector plate. Case Size: 152 x 140mm. 5 levers plus the detector plate. Both Charles and Jerimiah were born in Fordingbridge, Hampshire, and were apprenticed as blacksmiths. 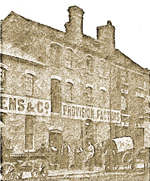 Initially they set up in business in Winchester but soon moved to Portsea where they specialised in ships ironmongery. This is where Jerimiah Chubb patented his lock on the 3rd February 1818 (British Patent AD 1818 No.4219). So far no locks have been found arranged as the patent drawing. It’s not unusual for the drawings in patents to differ as their purpose is to illustrate the principle. However the lock must have undergone a period of development and may have been produced prior to the patent being granted. Another intriguing point is that the serial numbering starts with No.1 but is dated 1819. Were locks produced prior to serial numbering? The answer is almost certainly yes. Initially locks were produced in Portsea but the production was soon moved to Wolverhampton and that’s when, it's believed, serial numbering started. So far none of these very early locks have been found. If you would like to know more about the artefacts in the collection you are welcome to ask questions or join in with the discussions on the History of Locks Forum. Simply email requesting a password. We are keen to extend the artefacts in this collection, don’t hesitate to contact our Curator if you can help in any way. We especially would like to hear from you if you, or your ancestors, were involved with locks and keys. 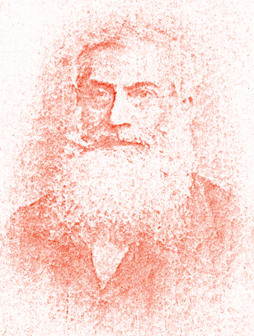 All images and text on this page and within this site "The History of Locks and Locksmithing Museum" ( http://www.historyoflocks.com ) are copyright of their respective owners and may not be reproduced without express permission.